Thunderball is downtempo on Thievery Corporation’s ESL Recordings. More jazztastic lounge funk from Washington DC. As one of the first artists signed to ESL Music, Thunderball released their first album, Ambassadors of Style, (1999) to critical acclaim. Rolling Stone lauded the album with 3 1/2 stars for its “smooth, cosmopolitan drum and bass.” Drawing from their love of ’60s and ’70s soundtracks, Brazilian beats and Afro-funk rhythms, Thunderball creates multi-faceted soundscapes designed for modern spy chases and late-night encounters. 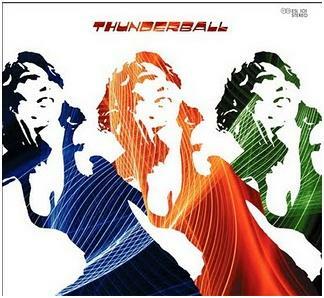 Thunderball’s seminal second recording, Scorpio Rising, (2001) was a downtempo classic, hailed by All Music Guide as “.blaxploitation funk, cinematic soul, bossa nova lounge, downtempo dub, and downtown drum’n’bass [that] all come together to create a hipster vibe few other groups could even aspire to, let alone create.” Scorpio Rising’s integration of live instrumentation helped establish the organic sound that shaped the future of Thunderball. After Scorpio Rising, Steve, Sid & Rob joined forces with Jon “JonH” Horvath to found Fort Knox Recordings and the DC-based mega-group Fort Knox Five. As the Fort Knox Five the group has released 6 highly successful singles and completed many high-profile remixes for the likes of A Skillz & Krafty Kuts, Skeewiff, Tito Puente, and Louis Armstrong. They also produced 4 tracks on Afrika Bambaataa’s latest album. Their efforts culminated in 2007 with the release of the Fort Knox Recordings debut CD, The New Gold Standard. ~ by acidted on December 31, 2009.